In our modern culture, we do not support women to rest and nourish themselves after childbirth. In fact, the superwoman archetype is glorified which leads to major depletion for women. That has repercussions later in life, our relationships, the way we show up at work and the way our hormones function. Ashlee offers alternate ways to take care of ourselves as women both during pregnancy and menopause. Ashlee has been fascinated and inspired by birth, babies, and pregnant mama bellies since she was a little girl. Growing up, she had the extraordinary opportunity to witness the miracle of baby animals being birthed into this world at her mom’s Veterinary hospital. Since 2011, she has been supporting women, their partners and family members through the rite of passage of birth as a labor doula and Ayurvedic postpartum doula. 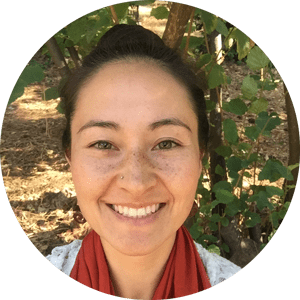 Ashlee studied nutrition at Cal Poly, Ayurveda at the California College of Ayurveda and doula work at the Sacred Window School of Ayurvedic Postpartum Care.